They’re starting to look like oranges, aren’t they? Ha! That’s cool, I don’t care. I’m learning as I go. The bottom lemon on the left was the first one I finished, and I learned that I should created bigger blocks of color instead of sprinkling a dozen different colors in order to get the effect I want. The middle bottom one reflects that. 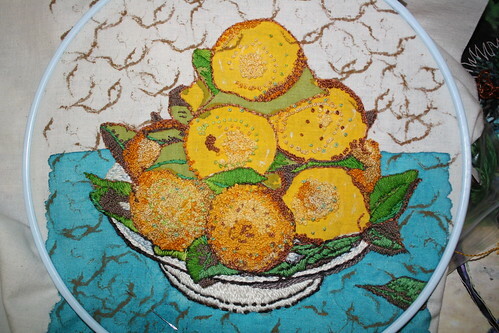 I thought that doing all these French knots would make me a little crazy by now but instead I find it very meditative. I think about stars and galaxies when I do this.